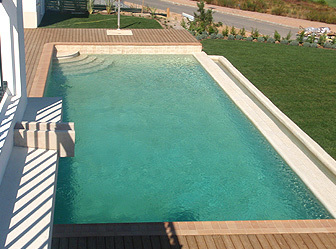 "With over 12 years of experience in constructing concrete swimming pools in Portugal, we can offer you quality pool designs with the strongest concrete structures available on the market"
Whether you are looking for a classic roman shape or a freeform to fit an awkward garden, we can design a swimming pool that fits your exact specifications. Natural Jacuzzis that blends into your garden landscape or overflowing into your main swimming pool, overflows into children's pools, waterfalls, natural rock features, along with many other features are available. As with all faucets of life… foundation is the key….All the swimming pools constructed by Iberia Blue are built using projected concrete over steel formwork cage. Creating a monolithic structure by utilizing projected concrete in a single action we remove the need for shuttering and therefore there is no requirement of a joint around the base of the pool. This method of construction is known to produce a stronger concrete shell yet also offers total freedom in design and is quicker than the standard block and shutter technique. Our interior finishes are hand applied by specialized applicators with years of experience. The pebble and crystal bead is sourced from all over the world, with some of our range coming from as far as Australia and New Zealand. The technique of a pebble finish in swimming pools was started in Australia over 20 years ago and it is estimated that over 90% of pools in Australia have this type of interior finish. The pebble is mixed with quartz and cement and hand applied to the prepared concrete shell. When the material is nearly dry the pebbles are exposed by washing the top layer of cement off. Leaving a smooth yet non slip finish. The pebble looks fantastic by the way!